Michael Anthony Napoli (born October 31, 1981) is an American former professional baseball first baseman and catcher. He played in Major League Baseball (MLB) for the Los Angeles Angels of Anaheim, Texas Rangers, Boston Red Sox, and Cleveland Indians. Up to 2013, Napoli was primarily a catcher. Born in Hollywood, Florida, Napoli attended Charles W. Flanagan High School in Pembroke Pines, Florida. He signed a letter of intent to play college baseball for Louisiana State but opted to sign with the Anaheim Angels after being selected in the 17th round (500th overall) of the 2000 Major League Baseball Draft. Napoli began his professional career with the rookie-level Butte Copper Kings, but sat out most of the year after suffering a lower back strain. He returned in 2001 with the High-A Rancho Cucamonga Quakes before transferring to Single-A Cedar Rapids. In 2002, he returned to Cedar Rapids, hitting .251 with 10 home runs and 50 runs batted in (RBIs) as the Kernels' primary designated hitter. He also started at catcher for 37 games. After being transferred to Rancho Cucamonga in 2003, he only played 47 games after injuring his right shoulder. In 2004, he hit .282 with 29 home runs and 118 RBI, ranking seventh in RBIs and ninth in walks in all of the minor leagues. In 2005, he was promoted to Double-A Arkansas, finishing second in the league in extra-base hits and fifth in runs scored. Napoli played for the Águilas Cibaeñas of Santiago in the Dominican Republic during the winters of 2004 and 2005. Napoli made his Major League Baseball debut on May 4, 2006, against the Detroit Tigers in Comerica Park, and hit a home-run in his first Major League at-bat off starting pitcher Justin Verlander. Eventually, Napoli worked his way to become the Angels' regular starting catcher. In 2006, Napoli hit .228 with 16 home runs in only 268 at-bats. Napoli began 2007 as the Opening Day starting catcher, and split time with José Molina through the first half of the season. The second half of the season was injury-marred for Napoli, as he suffered a sprained ankle on a game-winning play at the plate during the final game before the All-Star break, causing him to miss 12 games. He then suffered a strained hamstring only five games after returning, causing him to miss all of August. For the season, Napoli hit .247 with 10 home runs, appearing in only 75 games. Napoli again was the Angels Opening Day starter at catcher, and after fully recovering from his 2007 injuries, began the 2008 season by hitting six home runs in April. Napoli continued to share time behind the plate with Jeff Mathis, who had assumed the back-up duties after the Angels trade of Molina during the 2007 season. Napoli again was injured in July, causing him to miss 28 games with shoulder issues. However, after fully recovering from the injury, Napoli led all of Major League Baseball with a .457 batting average in the month of September. For the season, Napoli tallied a .273 batting average and 20 home runs, both career highs, and a .960 OPS. Napoli's production helped the Angels win the 2008 American League West Division championship, with a 100–62 record. During Game 3 of the 2008 American League Division Series against the Boston Red Sox, with the Red Sox holding a 2–0 series lead, Napoli hit two home runs against Red Sox starting pitcher Josh Beckett, helping extend the game into extra innings. He then singled and scored the game-winning run in the 11th inning, helping the Angels avoid playoff elimination. Napoli continued to compete with Jeff Mathis for the leading catcher spot in 2009. He also started 18 games at designated hitter while teammate Vladimir Guerrero was injured. Napoli set or matched career highs in games played (114), at bats (382), runs scored (60), hits (104), doubles (22), and RBIs (56). He also finished the season with a .272 batting average and hit 20 home runs for the second season in a row. On defense, he led AL catchers in errors, with 8. In 2010, the Angels reduced Napoli's playing time at DH after signing Japanese slugger Hideki Matsui. Napoli went into spring training with a bigger glove and worked on fundamentals in hopes of getting more playing time as a catcher. Napoli wound up playing the majority of the 2010 season at first base. He made his first major league start at first base on May 30, after regular first baseman Kendrys Morales broke his lower leg in a walk-off celebration. With the loss of Morales for the season, and the return of fellow catcher Jeff Mathis from the disabled list, Napoli started 70 games at first base, posting a .989 Fielding Percentage. Napoli set career highs in several categories, most notably home runs (26). He was 7th in the AL in strikeouts (137), in 453 at bats. Napoli also became the Angels all-time leader in home runs by a catcher during the 2010 season. On January 21, Napoli was traded to the Toronto Blue Jays along with outfielder Juan Rivera in exchange for outfielder Vernon Wells. Four days later, he was traded by the Blue Jays to the Texas Rangers in exchange for pitcher Frank Francisco. On May 29, he was involved in a controversial game-ending play at home plate in the ninth inning in a game against the Kansas City Royals. Napoli was at first and Elvis Andrus was up against Joakim Soria. Andrus hit a shot past Eric Hosmer that got into right field. Napoli was sent home by the third-base coach. Hosmer threw the ball to the plate. Brayan Pena tagged Napoli on the upper shoulder, but Napoli was called safe by the home-plate umpire, giving the Rangers a walk-off win. Pena was enraged and arguing with the umpires with manager Ned Yost. Replays showed that Pena did not block the plate, but tagged Napoli, who got his feet in just before the tag. In Napoli's first season with the Rangers, he batted .320 with 30 home runs (10th in the American League) and 75 RBIs, while improving his defense (throwing out 36% of base-stealers; 4th-best in the league). He had a .631 slugging percentage in 369 at bats. In Game 5 of the 2011 World Series, Napoli hit a two-run double in the bottom of the eighth inning to give the Rangers a 4-2 lead. The Rangers held on to win and take a 3-games-to-2 lead in the series, but eventually lost the World Series Championship to the St. Louis Cardinals in 7 games. On February 11, 2012, Napoli signed a one-year, $9.4 million deal to avoid arbitration with the Rangers. Napoli filed for $11.5 million, but the Rangers countered with $8.3 million. He received the second highest raise for anyone in their third or fourth time through the arbitration process, with Prince Fielder taking the top spot. He became a free agent after the season. On December 3, 2012, Napoli agreed to a three-year, $39 million deal with the Boston Red Sox, pending a physical examination. Following a six-week period during which the status of the deal was in question after his physical showed signs of a hip issue, Napoli came to terms with the Red Sox on a one-year, $5 million deal with incentives that could make the deal worth $13 million. The incentives were to stay on the active roster for at least 165 days (which Napoli achieved), or get up to 625 plate appearances with at least 120 days on the roster. On April 22, 2013, Napoli hit his fourth career grand slam in a 9-6 win over the Oakland Athletics. On September 15, 2013, Napoli struck out for the 178th time of the season, passing Mark Bellhorn to be the new Red Sox franchise leader in strikeouts in a season. Upon his strikeout, Napoli threw his bat and helmet in frustration and argued with home plate umpire Ron Kulpa and was ejected for the first time in his Major League career. For the 2013 season, Napoli batted .259 with 23 home runs, 92 RBI, and struck out 187 times. In Game 3 of the 2013 ALCS against the Detroit Tigers, Napoli hit a solo home run off Justin Verlander for the game's only run in a 1-0 Boston win. Although Napoli played more games at catcher than at any other position in each of his seasons with the Angels and Rangers, he did not catch a single game for the Red Sox in 2013, playing almost entirely at first base, with a few games as a designated hitter. During Games 3, 4, and 5 of the 2013 World Series, with the DH rule not in effect per National League rules, regular DH David Ortiz played first base and Napoli was taken out of the lineup rather than moved to catcher. After 6 games against the St. Louis Cardinals, Napoli received his first career championship ring as the Red Sox won their eighth World Series. He agreed to re-sign with the Red Sox on a two-year deal worth $32 million on December 6, 2013. During 2014, Napoli dealt with injuries throughout the season. He broke his finger in an early season game vs the Chicago White Sox. Napoli returned, but finger problems and sleep apnea took him out of the lineup for much of the late season. Napoli struggled in 98 games for the Red Sox in 2015, hitting .207 with 99 strikeouts, 13 home runs, and 40 RBIs. On August 7, 2015, the Texas Rangers acquired Napoli and cash considerations from the Red Sox for a player to be named later. Manager Jeff Banister used Napoli against left-handed pitching and played him in left field. He played 35 games for the Rangers in 2015, making 91 plate appearances and batting .295 with five home runs, 10 RBI and a .513 SLG. A double-sided sign, the visible side of which states "Party at Napoli's"
On January 5, 2016, Napoli signed a one-year, $7 million contract with the Cleveland Indians. During the season, Streetsboro, Ohio resident Nate Crowe coined the popular phrase "Party at Napoli's", creating a t-shirt with the slogan that was gifted to Napoli. Upon wearing the shirt during a post-game interview, demand for the shirts was high. Subsequent sales of the shirt have raised over $200,000 for the Cleveland Clinic Children's Hospital. Napoli batted .239 while setting career highs with 34 home runs and 101 RBIs. In game three of the 2016 American League Championship Series, Napoli's home run off of Blue Jays starting pitcher Marcus Stroman made him the fifth player to hit a postseason home run for four different teams, joining Ron Gant, John Olerud, Reggie Sanders, and Russell Martin. On February 16, 2017, the Rangers announced Napoli was signed to a one-year contract with a club option for 2018. The Rangers declined Napoli's 2018 option on November 6, 2017, making him a free agent. Napoli signed a minor league contract with the Cleveland Indians on February 28, 2018. The deal included an invitation to the Indians' 2018 spring training camp. He was released on March 22 in a procedural move to allow the Indians to avoid having to pay him a $100,000 retention bonus. Napoli was re-signed by the Indians to a minor league contract on March 23, 2018. On April 19, Napoli announced that he would be out for the remainder 2018 season due to a torn ACL and meniscus. This occurred during a minor league game with the Columbus Clippers the Triple-A affiliate of the Cleveland Indians. Napoli elected free agency on November 2, 2018. Napoli announced his retirement on December 8, 2018. ^ Gardner, Michelle (July 7, 2004). "The Rage Of Rancho Cucamonga". Sun-Sentinel. Retrieved 26 December 2017. ^ a b c d e f g h i "Mike Napoli Statistics and History". Baseball-Reference.com. Retrieved October 3, 2011. ^ "2008 American League Division Series (ALDS) Game 3, Los Angeles Angels of Anaheim at Boston Red Sox, October 5, 2008 | Baseball-Reference.com". Baseball-Reference.com. Retrieved 2018-01-28. ^ Cameron, Dave (December 17, 2009). "Is Matsui a Potential Problem". fangraphs.com. ^ DiGiovanna, Mike (February 25, 2010). 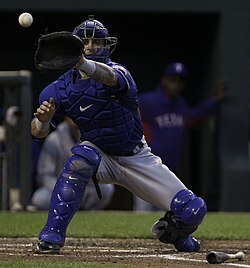 "For catcher Mike Napoli, the glove may hold the answer". Los Angeles Times. Retrieved February 25, 2010. ^ Gilbert, Steve. "Angels-Yankees matchup: Catchers". MLB.com: News. MLB Advanced Media. Retrieved January 22, 2013. ^ "Blue Jays trade Vernon Wells to Angels for Mike Napoli and Juan Rivera". Toronto.bluejays.mlb.com. Archived from the original on April 5, 2012. Retrieved October 3, 2011. ^ Stephens, Bailey (January 25, 2011). "Napoli dealt to Rangers for Francisco". MLB.com. Retrieved January 25, 2011. ^ Nicholson-Smith, Ben (February 11, 2012). "Rangers, Mike Napoli Avoid Arbitration". MLB Trade Rumors. ^ Cafardo, Nick (December 3, 2012). "Red Sox, Mike Napoli agree to terms on three-year deal". Boston.com Extra Bases - Red Sox updates and insights. ^ "Red Sox Sign 1B Mike Napoli to One-Year Contract". Retrieved January 22, 2013. ^ Boston holds off Tigers 1-0 behind Lackey, bullpen cbssports.com wire reports, October 15, 2013. ^ "Mike Napoli returning to Red Sox on two-year deal". USA Today. December 6, 2013. ^ "Science of nap time: The next frontier in the chase of an edge". SI.com. Retrieved 2018-01-28. ^ "Indians sign Mike Napoli". Cleveland.com. Retrieved January 5, 2016. ^ "How 'Party at Napoli's' and Cleveland Indians postseason run are helping sick children". Cleveland.com. Retrieved October 17, 2016. ^ Press, The Associated. "Everything you need to know about Indians-Red Sox". The Repository. Retrieved 2018-01-28. ^ "Mike Napoli brings Indians closer to party time". ESPN.com. Retrieved October 19, 2016. ^ "Mike Napoli introduced by Rangers". Texas Rangers. Retrieved February 16, 2017. ^ Adams, Steve (November 6, 2017). "Rangers Exercise Option On Perez, Decline Options On Barnette, Napoli". mlbtraderumors.com. Retrieved November 6, 2017. ^ "Indians invite 1B Mike Napoli to Major League camp". Indians.com. February 28, 2018. ^ Calcaterra, Craig (March 22, 2018). "Indians release Mike Napoli". mlb.nbcsports.com. Retrieved March 23, 2018. Wikimedia Commons has media related to Mike Napoli.